Maybe there's hotlink protection on that domain; the picture is not showing. It's showing now. Maybe it's my browser. 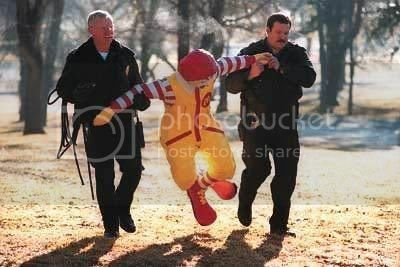 After being picked out in a photo lineup by the girls who had been working at the Arby's drive through, Ronald McDonald was taken into custody earlier today and charged with indecent exposure and harassment. Listen you idiots, it was the HAMBURGLAR, , HAM - - BURGLAR, , He has the word BURGLAR in his name, he's the one that did it. Don't you get it? He STEALS things, , He's a BURGLAR, , a ham - - BURGLAR. You're going down hard this time, Circus! "Heart disease? You can't arrest me for that!" Side note, I have a picture of this at my desk at work. It always brings a smile to my face when I see it. "In the criminal justice system, culinary offenses are considered especially heinous. The dedicated cops who investigate these food-based felonies are members of an elite squad, known as the Special Diners Unit. These are their stories."